Suzuki Intruder M 1800R was launched keeping in mind the international bike market (its main contender being Harley Davidson). The bike is packed with a number of advanced features and has ultimately become a “dream bike” for all bike lovers. Suzuki Intruder M 1800R has very elegant looks. The bike is available in two colors – Pearl Dark Cherry Red and Pearl Nebular Black. The headlight cover, smart and huge fuel tank, embossed logo, stylish side stand with chrome finish give a sporty look to the bike. The enormous aluminum handle bar and LED taillight assembly gives a very classy look. The spoke alloy wheels impart a sturdy look to the bike. Overall, the looks are extraordinary. 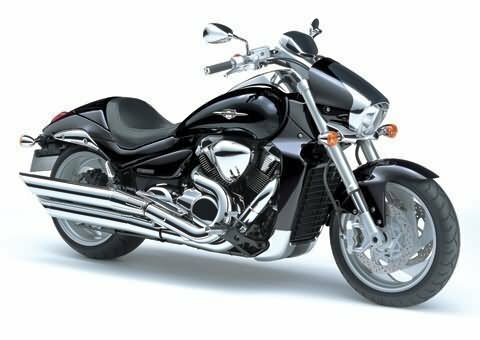 Suzuki Intruder M 1800R has many comfort features. The bike has Digital Fuel Gauge, Digital Tachometer, Digital -2 Tripmeter and Analogue Speedometer. Other comfort features include Passenger Footrest, Pass Light, Low Fuel-Indicator and Low Oil Indicator. Suzuki Intruder M 1800R has laid special attention on safety aspect. It has inverted telescopic, coil spring, oil damped (front) suspension and Link type, coil spring, oil damped (Rear) Suspension. These advanced suspensions are smart enough to add sufficient comfort. Braking system of the bike is very effective. The front brakes are twin along with the disk brakes and the rear brakes are disc brakes which provide a controlled and excellent ride. Suzuki Intruder M 1800R has 1783 cc, Four stroke, liquid cooled, DOHC, V twin engine. The massive engine has SDTV (Suzuki Dual Throttle Valve) digital fuel injection system. The cylinder available is coated with SCEM (Suzuki Composite Electrochemical Material) which makes them hard and heat resistant. The bike possesses the largest engine aluminium alloy pistons of 112 mm which gives powerful performance. The engine produces a maximum power of 127 bhp at 6200 rpm and a maximum torque of 160 Nm at 3200 rpm. The price of Suzuki Intruder M 1800R is Rs. 12,50,000 (taking Mumbai as base price location). However, the price specified is indicative price only and reflects lowest approximate price which excludes tax, registration, insurance and cost of accessories.